Week 3 kicked off with yet another self-referencing number, a disco-style tune, the theme of which seemed to be about what people are doing when they're watching Melfest? (In my case, I was just sitting in my living room, Chromecasting the SVT coverage to my telly, with wine and crisps at the ready). "I Can't Go On" - Robin Bengtsson. Prior to Melfest, this was probably the song I most wanted to hear. 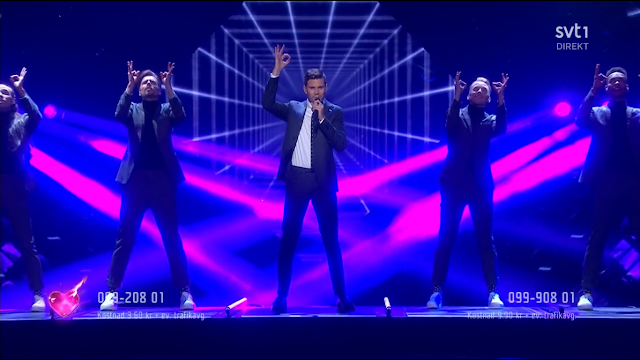 After all, "Constellation Prize" had turned out to be my favourite Melfest 2016 song. 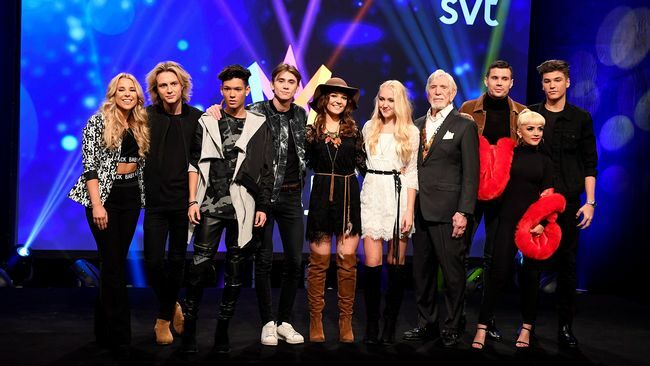 This song, co-written by 2013 Melfest winner Robin Stjernberg, promised to be a more uptempo number. All good so far then, until I actually heard the song. "Snurra Min Jord" - Krista Siegfrids. Fresh from her success hosting Finland's UMK, Krista returned to Melfest to try and build a schlager fanbase. She is trying hard, but I don't really know if there is a place for her in the Swedish music market. This song was OK but not spectacular. 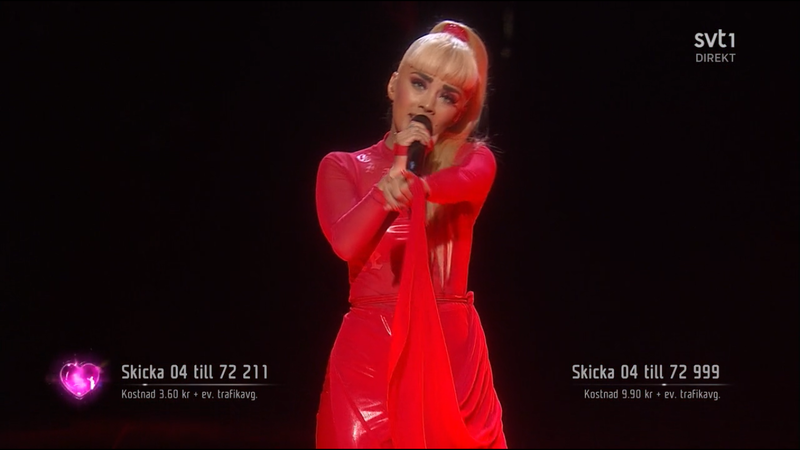 We'll probably see her again though, either in UMK or Melfest. "Kiss You Goodbye" - Anton Hagman. "Kiss You Goodbye" was also rather too close to "Stitches" for comfort. 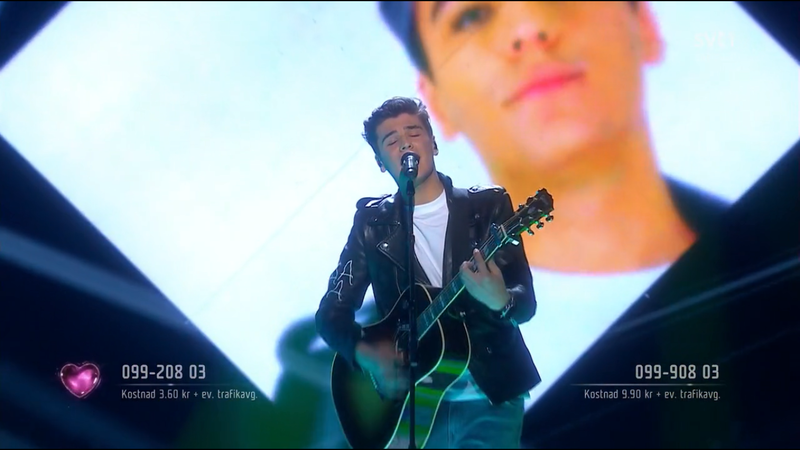 But the power of the "youth" vote in Melfest can't be underestimated (and the less said about that "app vote" the better) so it was inevitable that he would qualify to something. Before the contest I thought that Jasmine Kara might sneak some kind of qualification place so it was a surprise that she only ended in 6th place in this heat. Maybe people have just had enough of "Titanium"....! As indeed have I, as regular readers of this blog over the past couple of years might remember. "Boogieman Blues" - Owe Thörnqvist. 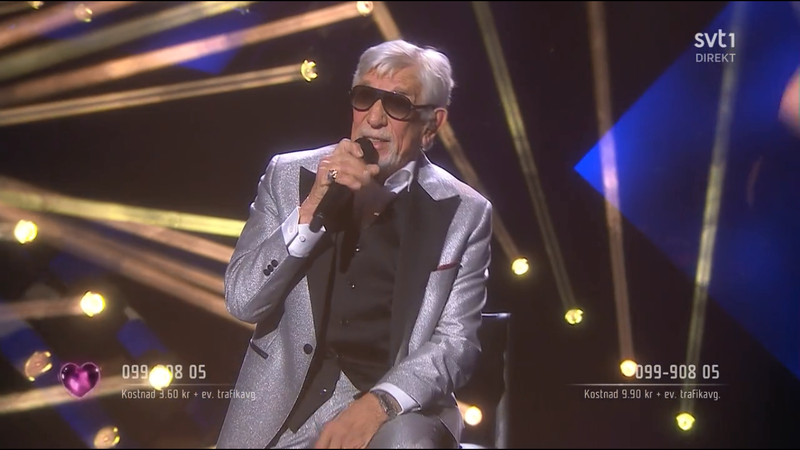 At 87 years old at the time of the contest, Owe Thörnqvist is the oldest Melfest contestant ever. So it's understandable if he wasn't as light on his feet as he used to be! I wasn't the least bit surprised at this doing so well, thanks to all the advance publicity, the nostalgia factor and, well, Owe still rocks! "Crucified" - Bella and Filippa. Remember the Common Linnets' simple but effective visual effect of the line down the middle of the road? So did Bella and Filippa, with a cheeky steal here. It must be a new "country music in song contests" trope. This was a very pleasant song although lacking in any spectacular features to take it out of its heat. "Gotta Thing About You" - FO and O. 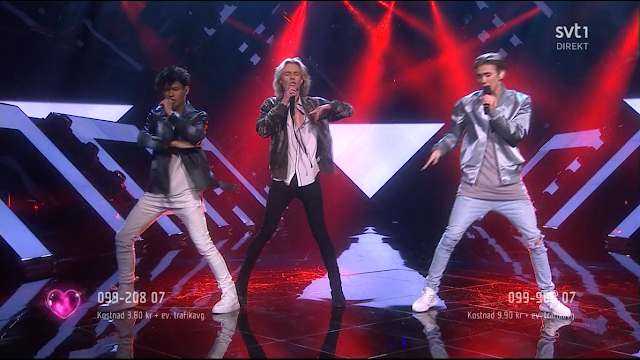 The popular boyband with more names than we've all had hot dinners (recent change of name due to them losing an O) finally made their Melfest debut. So, was this nonsense the best that legendary songwriter Mutt Lange could come up with? "Every time you bake I wanna eat cake". By the way that is not a tribute to the Great British Bake Off. At this rate, Melfest will be getting an X certificate. Top of the class indeed! The first interval act was Clara singing a rewrite of Alcazar's "Not A Sinner Nor A Saint", reinvented as a female empowerment anthem. 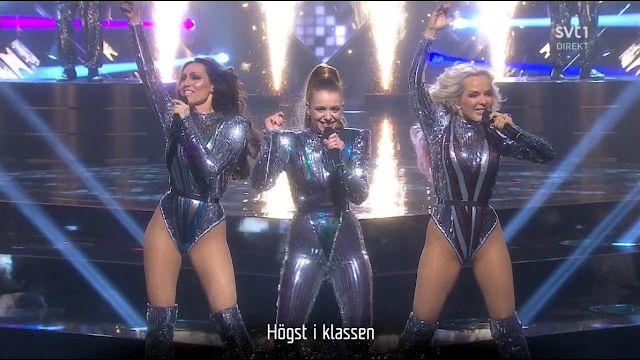 So it was very appropriate that she should be joined by Lina and Tess from Alcazar. Maximum glitter and glamour. 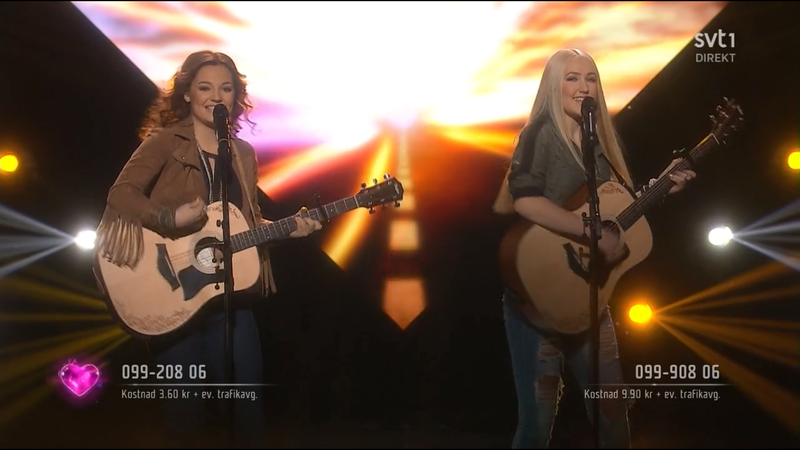 Melfest this year also welcomed a new tradition: the green room song by David Lindgren, which formed the second interval act. So I'm trying to do screenshots here but sometimes you just have to press the pause button for full effect. Sorry readers. (Anton Hagman grins a painful but relieved grin that he was spared David Lindgren's tongue. Robin Bengtsson not so lucky). Let the EuropeCrazy blog posts backlog begin!